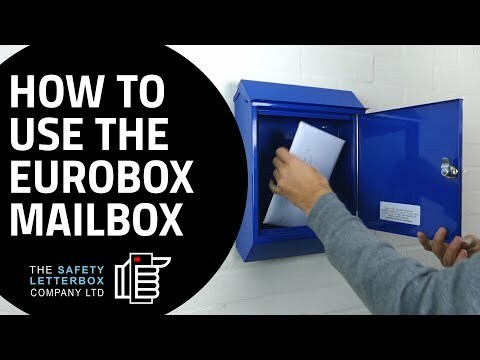 The Eurobox mailbox is a wall mounted individual item that securely stores deposited mail until later retrieval via a coded lock. Mail items are deposited into the mailbox at the top of the product, allowing them to drop to the bottom of the item away from the aperture. The Eurobox is available in a number of standard finishes (see below) that we continuously hold in stock ready for quick deliveries. We can supply the Eurobox in any finish from the standard RAL colour range on a slightly extended lead time. Euroboxes can also be finished in any specific RAL colour to meet your requirements, please contact us for more information. The polyester powder coating paint used on our Eurobox mailbox PPC range has been sample tested to 1,200 hours salt-water spray to ensure that the box remains resistant to consistently inclement weather – rust does not occur and the contents of the box remain dry. The Eurobox mailbox is manufactured using zintec steel to BS EN 10142/10143 and then finished with polyester powder coating to a choice of RAL colours from our standard colour range. The Eurobox is finished in a colour from the standard RAL colour range which is included in the normal price, but it is possible to have the mailbox finished in any RAL colour to suit your design requirements. This will incur a slight additional extra fee for the use of a custom paint finish. Please contact us directly for more information on this option. The stainless steel variation of the Eurobox mailbox is manufactured using grade 304L stainless steel designed to give a high-quality finish. Each Eurobox® comes complete with a drilling template, wall mounting fitting instructions and self-adhesive name case. Vinyl writing can also be applied to the mailbox as an optional accessory – the font . 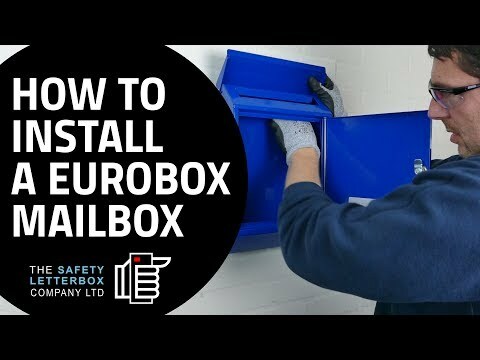 It is also possible to have the Eurobox in a PPC colour or Stainless Steel variation to be finished in a lacquer coating which adds an additional coat of protection to the finish of the mailbox. Single Eurobox mailboxes are available on a 2-3 day delivery time as standard. Orders for multiple mailboxes vary depending on the quantity ordered. Please contact us for more information. Can this post box accept A4 size mail? Yes. This mailbox can accept multiple A4 deliveries at once. We have tested the product thoroughly and the Eurobox can securely store up to 9 brochure sized A4 deliveries at once.